Sensational acid bright golden lime yellow coloured foliage all year round, especially in full sun. Gorgeous citrus lemon fragrance to leaves when crushed or trimmed. 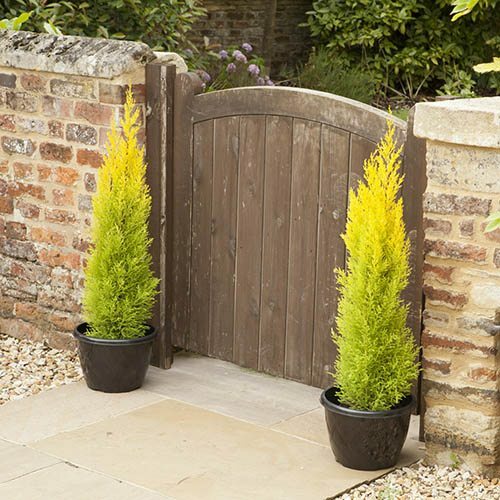 Slower growing trees, so make excellent features as a pair either side of a doorway, gate or porch. Fully hardy, so plant anywhere for year-round foliage colour and interest. The soft, bright golden-yellow foliage of Cupressus 'Goldcrest' will provide your garden with healthy colour all year round and (in keeping with its name) gives off a fresh, lemon scent when foliage is crushed or cut - which is said to deter biting insects from that area of your garden. In the depths of winter, the cooler temperatures give the trees a deeper, richer colouration, giving you added visual impact in your garden. Also known as Monterey cypress, it's such a great all-round garden plant it has been awarded the coveted RHS Award of Garden Merit so you can be sure that it has been trialled and tested and declared garden worthy! Growing to 3-5m tall in 10 years, Goldcrest is naturally upright and slightly ‘teardrop’ shaped but can be trimmed to suit your required height and makes perfect topiary. It is very easy to manage and can be kept in post on the patio for many years, where it will happily sit at centre stage of your displays. Golden Scented Cypress will grow in virtually any soil and in any location from full sun to partial shade (although for the brightest of golden-yellow colour it is best in full sun and protected from drying winds). It is completely winter hardy throughout the entire UK and is virtually pest and disease resistant too. Supplied as 6 x plants in 9cm pots, ready for planting out into the desired location. Supplied as 6 x plants in 9cm pots 40cm tall, ready for planting out into the desired location. Once plants have reached the desired height and width, prune the new growth in early summer and mid-autumn each year. A hedge trimmer will leave the perfect finish. Remove your 'Goldcrest' from its pot and tease out a few of the roots. A ‘little and often’ approach to trimming of the young, soft shoots will allow you to easily keep it to the shape and size that suits you.